On their way to Las Vegas for a weekend of debauchery; Dawn, Cindy and Morgan decide to stop at a greasy spoon to get some grub. Mel’s Diner looks like a decent enough place and their advertised ‘best burgers this side of Vegas’ entice the girls to give it a try. While at the diner; they eat, make fun of the restaurant’s patrons and finish the meal off by doing the most sacrilegious thing a customer can do – skip out on their bill. What ensues is a large truck with its headlights off following them along a deserted stretch of road, a blinding light that causes them to almost wreck, a few shotgun blasts, a long walk down a dark road and some horrific events that unfold inside a cabin deep in the woods. Is it the diner’s owner coming to collect on girl’s tab or someone with more than just money on their mind? What do they want? What is the driver of the truck willing to do once they come to an abrupt stop on the side of the road? The three college friends will find out soon enough. 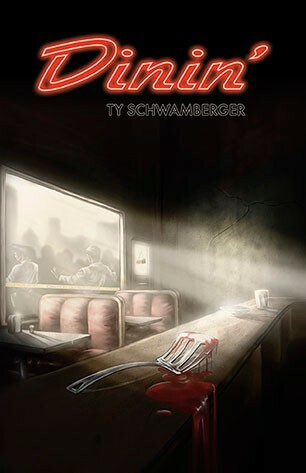 "Ty Schwamberger effectively conjures a fun Richard Laymon-esque atmosphere in DININ'. The terror starts early in this one and rarely lets up." --- Bryan Smith, author of The Killing Kind, Depraved and Highways To Hell.